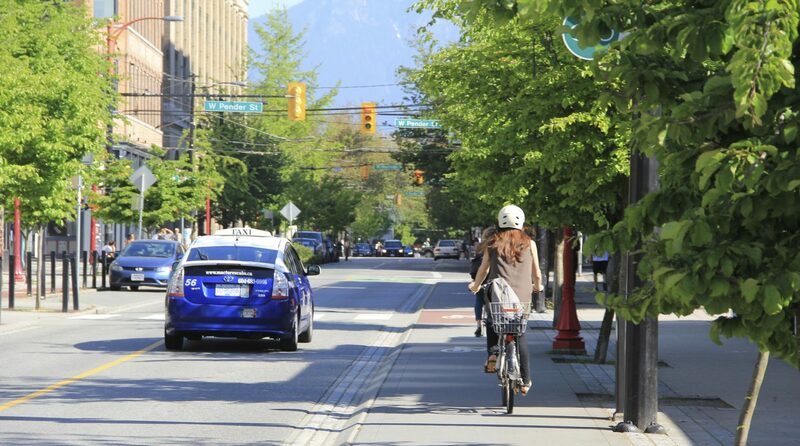 The Region sits on the cusp of transformative change when it comes to cycling infrastructure. At Tuesday’s Planning and Works Committee meeting, regional councillors will be asked to approve two reports regarding all-ages-and-abilities cycling infrastructure around Uptown and the universities. Your voice is essential in ensuring councillors vote to deliver on these projects. The Uptown King Street bike lanes, which TriTAG played a key role in promoting, have in their implementation received a fair amount of criticism. Justifiably so. The mountable roll-curbs have allowed easy access to illegally parked or stopped vehicles, and enforcement efforts by the City of Waterloo have been pitiful. Proposed fixes to the Uptown bike lanes include flex bollards and better signage. 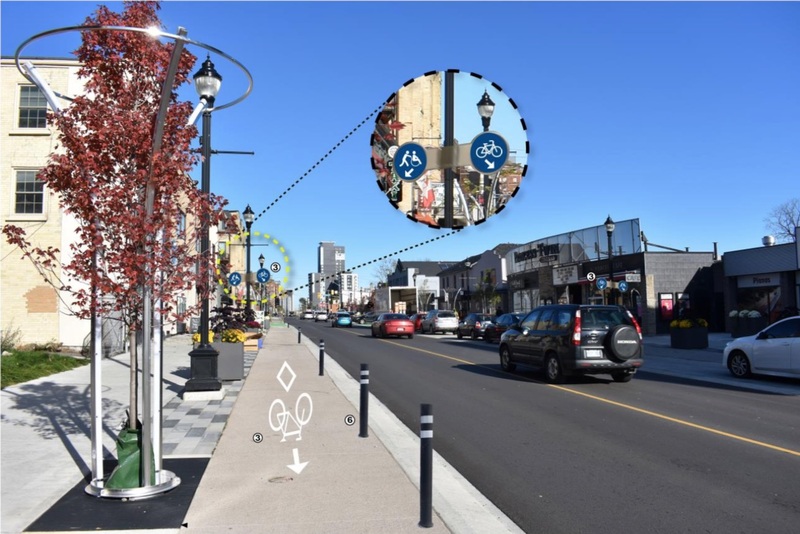 The good news is that staff have listened to public feedback and are now recommending flex bollards for subsequent phases of the streetscape project, as well as retrofitting the southbound bike lane and frequent encroachment points on the northbound lane with bollards as well. 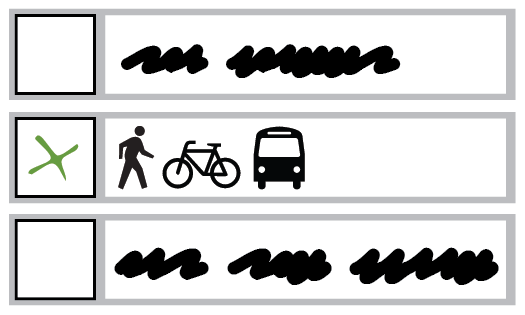 Better signage to encourage pedestrians to avoid meandering into the lanes is also proposed. The long-awaited protected bike lane pilot project is also on Tuesday’s agenda. 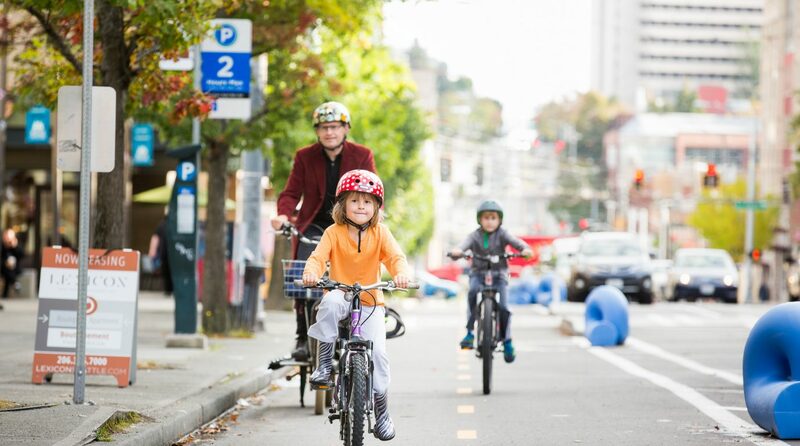 Modelled after cycling network pilots in Calgary and Edmonton, which saw huge surges in cycling trips after they were built, the pilot would focus on both protected infrastructure and rapidly forming a cohesive network of routes in a high-demand area. Existing road space on King Street, Erb Street, University Ave, and Columbia Street around Uptown and Northdale would be reallocated to provide bike lanes with buffers and flex bollards. Precast curbs would also be used on King, Erb, and University. What’s remarkable about the pilot is the degree to which Regional transportation staff are willing to consider narrowing or removing motorized vehicle lanes to facilitate the project. 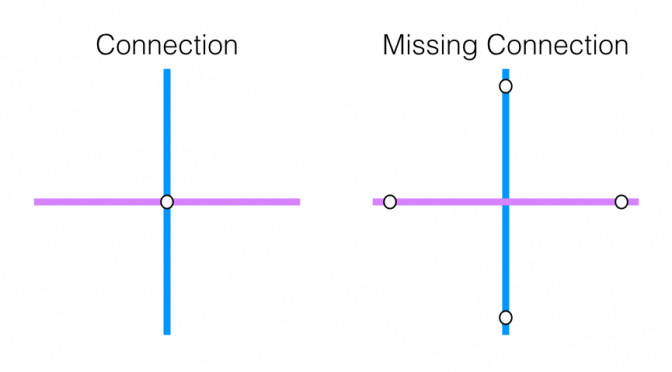 Until now, challenges to the Region’s road dimensions dogmatism (unless it’s to reduce the width of a bike lane) have been virtually non-existent. However, narrower travel lanes lead to safer speeds and shorter crossing distances for pedestrians, which reduces the number and severity of collisions with vulnerable road users. Staff are also willing to accept some impacts to car travel times at intersections where they plan to add two-stage bike boxes for making safe turns, acknowledging that motorist habits and routes will change in response. These changes in attitudes are most welcome! It is disappointing that the proposed network is somewhat scaled back from an earlier vision staff were considering last year. 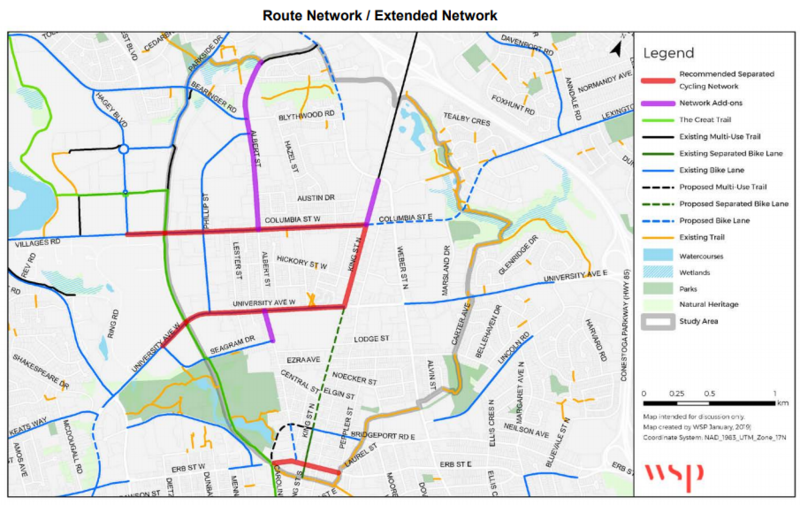 These reductions are now listed on the map as “add-on extensions.” Dithering and delays (the pilot was supposed to have been built in 2018) have cost the Region support from a provincial government no longer interested in funding cycling infrastructure. The Albert Street extensions fall under City of Waterloo jurisdiction (staff hope to coordinate with the city to grow the pilot on their end). The King Street extension north of Columbia, which would provide vital connectivity to the multi-use paths between Weber and Conestoga Mall, is dismissed because staff value higher motorized traffic volumes over cycling along that corridor. Still, the pilot represents an important shift in infrastructure development in the Region. Indeed, staff are hoping to repeat the pilot in Kitchener and Cambridge, so this project is a big first step towards a coherent minimum grid of protected cycling routes. The more councillors hear residents celebrating the pilot and the Uptown improvements, the more they’ll be likely to vote for them. We’d encourage you to take a few minutes to write to your councillors urging them to support these two projects. The future of cycling in Waterloo Region depends on them. On Tuesday, councillors will be finalizing the 2019 Region of Waterloo budget. 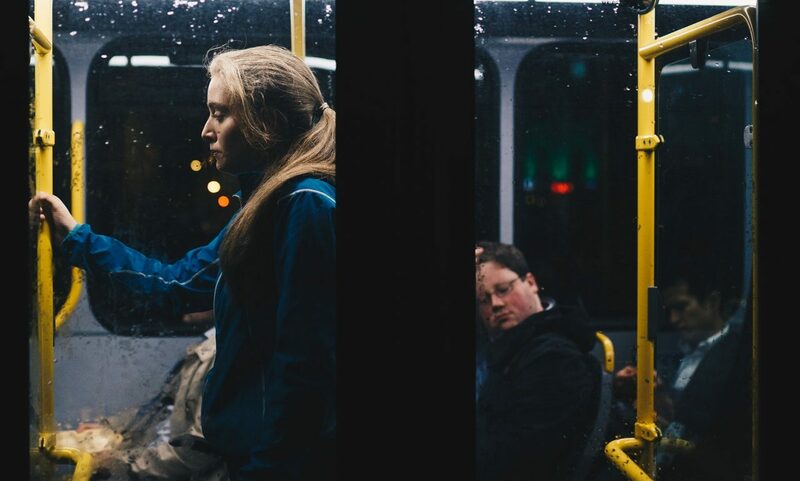 Unfortunately, proposed transit improvements, vital to Grand River Transit’s growth, are under potential threat, as councillors seek to trim costs. 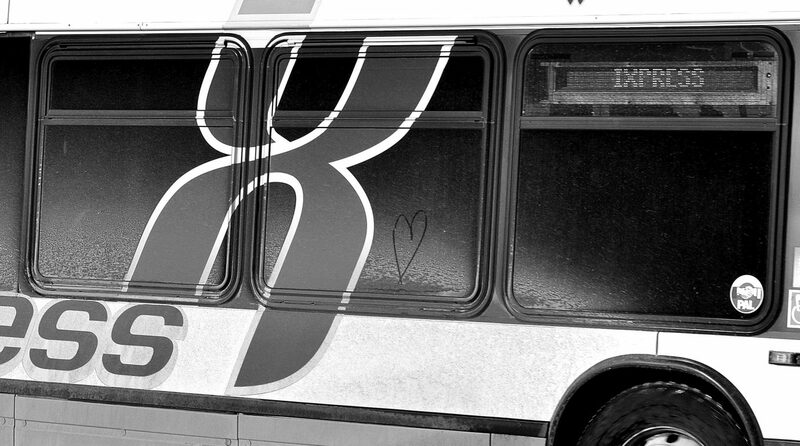 This year’s proposed transit improvements include a new 206 Coronation iXpress route connecting Fairway, Preston, and Galt, as well as a bunch of improvements and route changes that would help equalize the level of transit service in Cambridge with that of Kitchener and Waterloo. It’s a vital part of the already watered-down GRT business plan, and an important precursor to ION phase 2. Unfortunately, the Region’s online budget survey, dominated by non-transit riders, showed low levels of support for these improvements. Councillors reading the survey results might think they have political cover for cutting planned transit service from the budget. Please take a few minutes to send an email to your regional councillors in support of the transit improvements in the budget. A strong expression of support will go a long way in ensuring our community continues to invest in equitable and sustainable transportation. Other important measures in the proposed budget include the hiring of a planning engineer who will help coordinate active transportation projects and a bus pass program for Conestoga College students. The Uptown King Street bike lanes are finally open! Well, at least for the short stretch from the Spur Line to Bridgeport. And provided nobody parks or dumps garbage in them. After initially supporting a winter sidewalk maintenance pilot exploring proactive enforcement and plowing options in committee, Kitchener Council flip-flopped in the wee hours of Tuesday morning and voted 7-4 to not consider any plowing options this year. Shockingly, Councillor Galloway-Sealock, who moved the deferral, implied that she was discounting the opinions of residents who supported the pilot as unrepresentative, as if sharing TriTAG’s position was somehow disqualifying. Fortunately, your opinions can’t be so easily discounted at the ballot box October 22. A set of election priorities worth adopting here too. 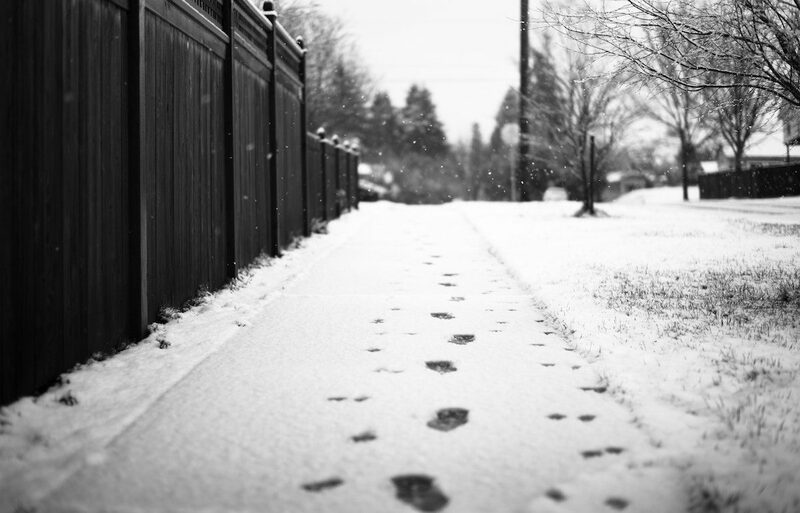 This past week, the Kitchener Community and Infrastructure Services Committee approved a plan to pilot different alternatives for keeping sidewalks clear and accessible in winter. The plan would see the city test out proactive bylaw enforcement, full city plowing, and shared responsibility between homeowners and city contracted plows in various parts of the city. It’s an important first step in figuring out how to best ensure our sidewalks are open and safe year-round. However, we’ve become aware of an intense lobbying effort to cancel the plan at Monday’s upcoming City Council meeting. 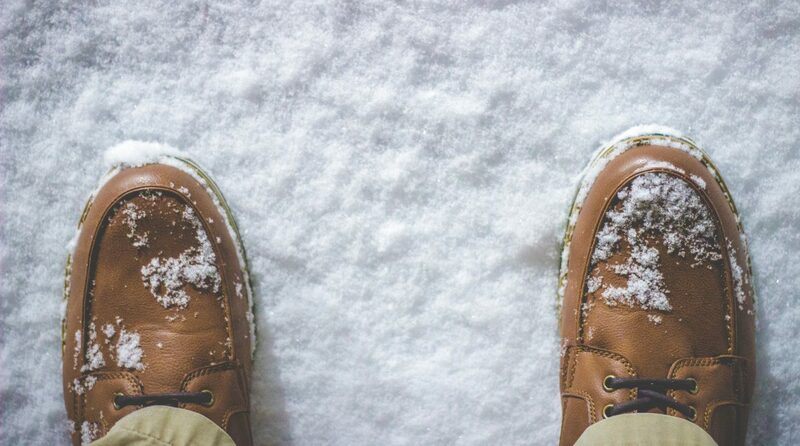 Don’t let the naysayers dump snow on the path to equitable winter sidewalks – speak up for improving winter mobility! A quick email or phone call to your councillors expressing your thanks for supporting the pilot would go a long way. Better yet, if you’re able to, attend the council meeting on Monday June 25 and register to delegate. You can also help to spread the word on Twitter and Facebook. Watch for the hashtag #snowbilityWR and don’t forget to tag your councillors! The Progressive Conservatives have won a majority government in the Ontario Legislature. What does that mean for provincial transportation policy? Our best guess can be found in our review of party platforms and promises. Kitchener staff have shared their plans to test winter sidewalk clearing options: proactive enforcement, plowing after every snowfall, and a hybrid of property owners and city-run clearing where plows are only deployed after major snow events. 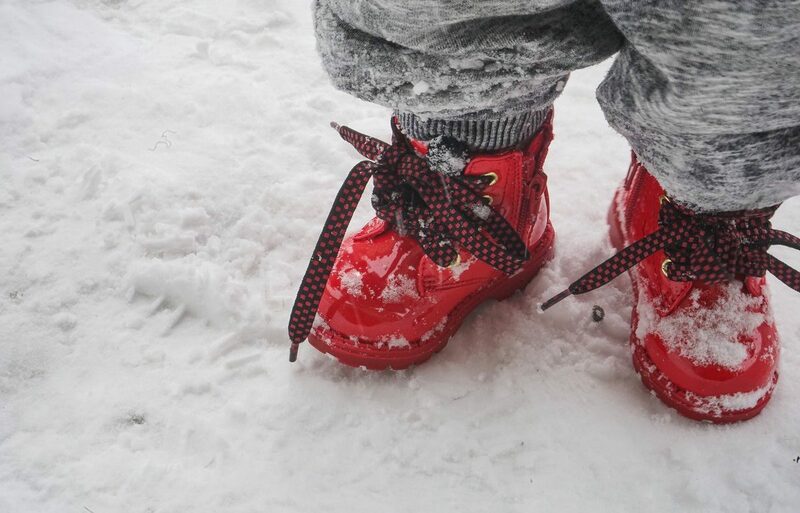 The study would also try out sensors that can detect the presence of sidewalk snow and ice. Waterloo Regional Police have released a pair of videos containing tips for people cycling and driving to “share the road” safely. The cycling video has drawn criticism for admonishing “keeping to the right” at all times – in contradiction with guidance from the City of Kitchener regarding sharrows and the Ministry of Transportation’s own cycling safety guide, which discourage staying to the right if the lane is too narrow to share. According to provincial guidelines for transportation engineers and planners, “sharrows are intended to guide cyclists as to where they should ride within a travel lane shared by both motorists and cyclists.” We’re don’t tend to be fans of sharrows – too often they’re a cop-out for real infrastructure – but it’s disappointing to see our police contributing to the public’s confusion surrounding them.